Kayla Bailey was the first ever winner of an NHD contest! During the release of our NHD Clothing Spring/Summer line Kayla helped us spread the word through twitter and was thus entered into our first contest to win a FREE tshirt. 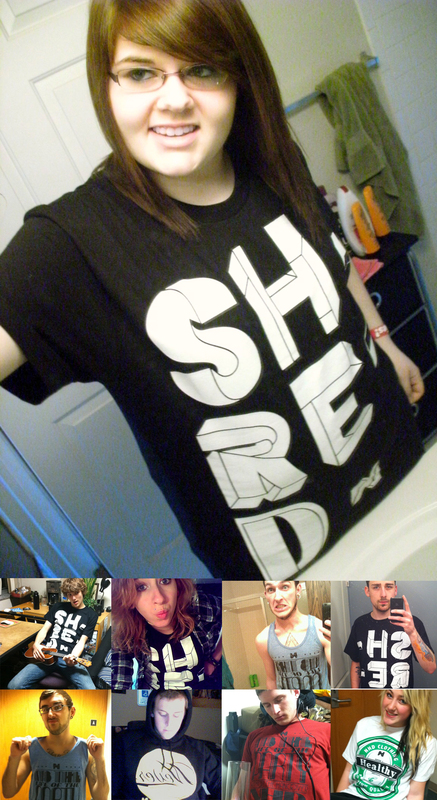 Well, needless to say she was very pleased with the outcome and we had her send us a pic of her new small fortune in the form of the SHRED Tee. Also pictured are a couple happy customers and random pictures of a couple designs from the line. Lookin snazzy folks! Since the first contest is obviously over we have added a NEW contest to none other than the contest tab of our site. Head on over and take a peak as you could be the next winner of a FREE tshirt from NHD Clothing! And trust us, it involves nothing more strenuous than sitting in the chair you are currently in. What could be better than that? Absolutely nothing. So head on over to our Contest page and find out how you can be entered. But hurry! The next winner will be chosen at the end of this very fine month of April. Don’t miss out!